At swimming practice last weekend, my friend Deborah showed me five years’ worth of calendars that she uses to track her health and fitness goals. Cute stickers were awarded to any day she made it to swimming practice, ate well, didn’t drink alcohol, and focused on the positive things she wanted to manifest in her life. There were weeks and weeks full of dots and images. Research suggests that tracking behaviors is one of the best ways to eat healthy and lose weight, so I asked Deb to share her story (and unique system) with my readers. Below, read how the simple act of tracking daily behaviors—or even just one of them—had a profound effect on Deb's health. In my 53 years, I’ve been on every type of diet and tried all the exercise trends. When I got married seven years ago, I got my weight down to 117 pounds for the wedding. Then came the Caribbean honeymoon, followed by big dinners out with my hubby, and lots of wining and dining. Those 117 pounds were nothing more than a distant memory. About a year after the wedding, I was really sick of dieting and knew I couldn’t do it alone. I called my sister, Kathy, and she and I outlined eating and exercising goals, agreeing to talk about them once a week. I switched to a gym closer to my home, hired a personal trainer, and bought a Tanita scale that calculates your percentage of body fat. That day, I weighed 127 pounds with 29% body fat. I found a picture of a pure and healthy little blonde girl and made stickers of my health “angel.” I also vowed to start swimming competitively again; I used to love the water and being outside. Unfortunately, it took me almost a year to get to the pool because I kept trying to lose weight before I got there. Finally, Kathy and I just set a date and I had to go. It was the best thing I ever did. Ever! Once I started swimming again, it forced me to eat better, get more sleep, and hardly drink alcohol, because the workouts were so hard. I started swimming in meets to give myself goals and added incentives to stay fit. And I started tracking everything! 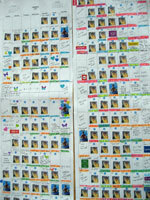 Take a look at my angel calendar sheets over the years. As I look back over five years of stickers, I see many things: how far I’ve come, what I’ve accomplished (the good and bad), and how my body weight, diet, and drinking correlates with my swimming. The goddess stickers remind me of the challenging events—huge work projects with mountainous obstacles or fear-ridden events like swimming in the San Francisco Bay—and the heartwarming ones. I have plenty of experience beating myself up, like gaining some weight at Christmas, but my tracker serves as proof that I can lose the weight if I eat well and exercise. And if I think I will feel badly about weighing myself, I don’t. I will probably use stickers for the rest of my life, and I wish you the best of success if you decide to track the special things in your life too.